This is a review of the Foot Spray which is manufactured by Naturally Fresh. This spray claims to eliminate foot odor in both women and men as well as help heal athlete’s foot. Read on to learn if this product is right for you and your symptoms. Natural mineral salts are commonly used as an alternative to a traditional deodorant. Salts work as a deodorant but not as an antiperspirant. It is not the sweat your body produces that causes odor but the bacteria that already exists. By applying natural mineral salts to the areas with bacteria, such as under the arms or on the feet, you can possibly pre-emptively kill odor-causing bacteria before they fester. However, if you try to use salts as a deodorant after you have already started to smell, you will find it is not effective because it is a preventative measure and does not work to mask odors. Aloe is a very common skin soothing agent that is often used in sun and after-sun care products. This product fits the following description: fragrance free, hypo-allergenic, paraben free, cruelty-free and free of aluminium. The only instructions for suggested use is to spray onto the feet. Make sure to include the soles of your feet. To remove odor from shoes, spray the product into your shoes and leave in overnight to eliminate odors. There are no listed side effects associated with using natural mineral salts on your body. This product does not include any chemicals that traditional deodorants do, so there is no warning listed for this product. This product is probably safe for use on children and on women who are either pregnant or breastfeeding. The manufacturer notes that if a rash occurs in the area where you are using the product, you should stop using it. You should also avoid the use of this product on skin that is broken. 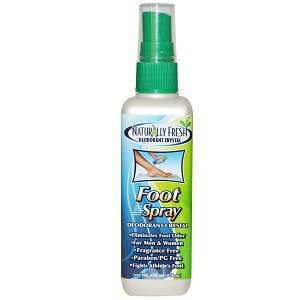 The retail price for Naturally Fresh Foot Spray is set at $3.07 for 4 fl oz. This price is discounted from the manufacturer’s suggested price of $3.99. If you buy this product in bulk, you will receive a discount of 10%-15%. The manufacturer, Naturally Fresh, offers a 100% satisfaction guarantee on their products. You may return any of their products to them for any reason as long as it is within 30 days of the original purchase. If you are returning multiple items, only one opened item will be eligible for a refund. Opened items may be eligible only for merchandise credit or a partial refund. The retailer does not provide a guarantee for this product. However, it does provide 61 reviews of which 33 are positive. This product seems to be an effective deodorant for several parts of your body because of the natural mineral anti-bacterial properties. However, it is unclear whether or not it will treat athlete’s foot, which is a fungal infection. There is also the potential risk of getting a rash from this product which will only make a fungal infection more uncomfortable. Jimmy Rodriguez	reviewed Naturally Fresh Foot Spray	on June 11th	 and gave it a rating of 3.